The desire towrite this article came from the film "Coco avant Chanel" (2009) playback, as Audrey Tatu representing the 20th fashion trend setter in Coco Chanel's or in real name Gabrielle Bonheur Chanel (19.08.1983. - 01/10/1971). The film begins with the main female lead - 12-year-old girl getting intothe orphanage and ends with a fashion show, which marked her way to the zenith of fame. 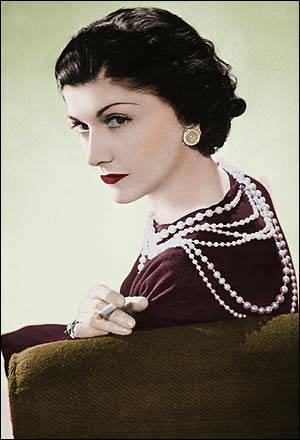 When you hear thename of Coco Chanel, surely every woman can name at least two timeless things she created - a small black dress (created 20.year mid-20th century) and perfume ("Chanel № 5"). But this time not so much about her biography, or achievements in the field of fashion, but about Coco Chanel's philosophy, which, of course, reflects in her works. Coco Chanelas a key from her fundamental principles declared the comfort and shape and color purity. Her clothing style and later created works confirms it the fullest. In the beginning of 20th when the whole society lady's chests were crushed by the rigid corsets, which often led to fainting and inability to move quickly, Coco Chanel completely withdrew from this garment. She preferred a simple white shirt or blouse. When Coco, thanks to her powerful lovers (she didn’t have a husband), makes it possible to get in higher society ladies circles, she admired the graceful initially hats with feathers, artificial flowers, bouquets, and strings of pearls, but soon realized that it’s, for her, unfamiliar. She came to the picnic in costumed men shirt, trousers and with a miniature tight hat on her head. She was followed by admiring glances - a simple and elegant. I have to saythat there were especially dear two colors for her - black and white. This is an essential prerequisite for the creation of small black evening dress, even though there was another - her beloved man BoyCapel death in car accident in 1925 on the French Riviera. Since he was married and Coco could not otherwise express her grief like just to put on a simple black dress with an oval neckline. Originally, the rig caused a wave of false language of Paris society, but later its simplicity, convenience and universal applicability due to the small black evening gown won both the French and all the women's tastes. Even today it is an integral part of every ladies wardrobe. Coco Chanelused neutral colors and easy to wear and maintain materials that were simple also in their form and cut. It is difficult to imagine a Chanel flowery dress with many flounces or ribbon. Her fashion brought comfort and elegance, and this combination was considered revolutionary. Chanel used Lace and satin ribbon, but mostly black and order to only some parts highlight. She created costumes, accessories and style of things except black and white are beige, gold, silver or red. Like thecolors, as well as her life and character showed excesses - from the children's shelter girl up to fashion queen from the robustness and some courage and passion and fragility of the soul, from the black to white. Since Her earliest youth, quite purposefully she went to the achievements looked for the right people, familiarity, and did not fear to climb on the stage - the initial stages of the musical cafe, then the fashion podium. Freedom inbody movements, your beliefs and decision-making, freedom from the society prevailing stereotypes and style templates - it created a fashion queen Coco Chanel. - Elegance must be comfortable, otherwise it is not elegance. - A woman who doesn’t use perfume has no future. - If you are created without wings, does not prevent them to grow. - Everything is in our own hands and should not be let down. - Very expensive clothes make older the person. - If you are struck by its beauty, a woman, but you cannot remember how she was dressed - it means she was dressed perfectly. - Disgust often occurs after pleasure, but sometimes it is before it. - There are people who have money and there are rich people. - I like the fashion streets, but do not permit that fashion comes from the street. - Expensive clothes make people older. - Fashion and architecture – they’re a question of proportion. - In order to be irreplaceable, it is necessary to change all the time. - Your face is 20 years, given the nature from what it will be in 50 years; it's up to you the same. - Age doesn’t save you fromlove, but love saves you from the age. - If you have time to work, then it is time to love. - Fashion goes, style remains.